Are you trying to solve the Kindle Fire WiFi authentication problem? Your Kindle Fire won’t connect to WiFi and you keep getting “authentication failure”? This post will help you solve the Kindle Fire WIFI authentication issues. 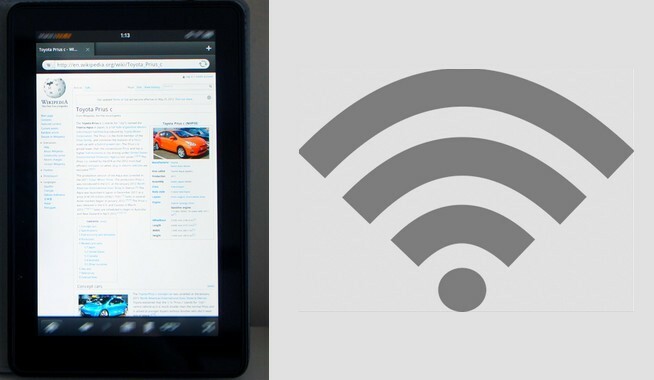 Wi-Fi problems with the Kindle Fire can sometimes be solved by simply going to your Fire settings, turning airplane mode on, then off – the device may then re-connect automatically. More involved but almost a sure solution: Restart the router – unplug it for a few minutes, plug it back in and it will reboot. Restart the Fire – press and hold the power button for a minute. Wait 30 seconds. Now press the power button again. Tap on wireless, tap on your network and click ‘forget’, enter password – FOR THE ROUTER – you will find this passcode on the bottom of the router. It is the SSID code, likely to be a mixture of characters. The Kindle Fire WiFi authentication problem may be caused by using the password not the authentication key. Putting in the Wireless Key digits that are on the bottom of your router instead of your password can solve the issue. Check in the network list, if there is a padlock icon next to your network. If so, you have to enter the WEP Security key or the WPA Pass key – a series of digits, to open the Wi-Fi. Ensure you use the correct UPPER and lower case. “Authentication failed” may be caused by too many routers using the same channel – the channel may be swamped by those other routers on the same channel. Or by too many devices on the same channel – the router may automatically switch to a less congested channel. After switching channels a couple of times and finding a stable one the problem should be solved. If it’s on auto, try changing the router portdl from auto to channel 6 to 11. One other resolution to the authentication problem – go into your account setting and unregistered, then reset to factory settings. Once completed set up you wifi again – this usually works when all else fails. Kindle Fire Wi-Fi issues can sometimes be solved by changing the wifi configuration from b/g/n to only g.
If all else fails have Amazon customer services call you – they can walk you through and get things sorted. Google ‘Amazon Kindle helpline’ and you will eventually find a box saying ‘Contact us’ on Amazon site. Click on this, ask for help via the phone. Put in your number and they will ring you up shortly. If everything used to work fine and stopped working all of a sudden, there can be many reasons for this. For example, an auto update could have been sent to your router or the Kindle Fire. Or, too many devices or routers on the same channel. Having a problem with the Kindle Fire WiFi authentication can be very frustrating. The good thing is that the “authentication failed” error can be fixed if you try the solutions from our list. If your Kindle Fire is still failing to authenticate and you continue to struggle with the Kindle Fire WiFi authentication problem, your best bet is to contact Amazon customer service. They will methodically go through possible culprits and help you fix any wireless problems with the Kindle Fire HD, HDX etc. All I can say is ‘THANK YOU, THANK YOU’ for the advice worked like a charm after an hour of trying to connect. I tried several fixes and nothing worked until I used the wireless key on the back f my router. Thank you. I rebooted the router, rebooted the Fire, tried the admin password, tried the key, did those steps multiple times, no luck. Changed my wifi account password, tried that too. Turned off other devices, that didn’t get things over the hump. Amazon customer service called me and predicted the problem was with my provider not with them – since the Fire connected okay for me at work. Sounds logical enough. Still stuck, have wasted three hours so far. Maybe will have to fart around with a second comms company now, the CenturyLink helpdesk. Thanks. For me, it was the ‘FORGET’ that fixed everything. Cheers. 1. Reset Kindle to factory defaults. 3. Unplug router for a minute or so. 7. Enter SSID — the lengthy number on the router — in upper case as necessary. It should immediately begin to find the WIFI address. Thanks-it was easy to do once I had instructions! Thank you, got my wifi back on amazon fire, went into wifi settings, pressed ‘forget’ then pressed appropriate network, put wireless password in, now I’m connected!! Such a relief to resolve the issue. Thank you so much. authenticate ” fallowed your instructions and like magic the device was back and working. Changing my router’s wifi setting to 802.11 g (instead of 802.11 b/g/n) is what solved it for me. Thanks for the suggestion! Nothing works including deregistering. Second Galaxy HD8 with this problem. Thank you, that worked right away. I put the letters and numbers that are on the bottom of the WiFi box in and it connected. Perfect. Another option is simply to turn wifi off on another device you’re not going to be using,like your phone for example,works a treat. It worked! I turned my FIRE off for a minute, etc. Re-entering the password got it up and running again. Thank you. Thank you this fixed my problem. I couldn’t understand why one tablet worked just fine and the other wouldn’t. I still don’t but both working fine now. Thank you so much! Your suggestions worked and I could finally connect. Just bought Amazon fire today so frustrated ! Will be returning! Bottom line NOTHING brand new should take this kind of effort! You shouldn’t have to troubleshoot a tablet right out of the box! F THAT! All of a sudden my Kindle Fire no longer allows me to conect to wifi. I get the following message. Sorry – “The application QuickSettings (process com.lab 126.otter) has stopped unexpectedly. Please try again.” I have tried to connect many times to no available. I am at a new location but I have strong wifi reception on my other devices. It won’t even allow me to see the available wifi signals. Help! I keep getting authenication failed on my Kindle Fire Wi Fi Just happened today. Tried several things still not working. Thank you this helped me so much ! Changed the password to my WiFi security key ,on my phone . it came right up. Thank you. The second solution worked on my new Fire HD 8 tablet (7th gen.) Rebooted both router and tablet, then pressed on my network and selected forget. I then tapped it again and entered in password box the – Key/Passphrase: for CenturyLink router found on the sticker, and pressed enter. It immediately showed connected instead of “saved”. I was online and up and running. I had struggled with no success and was frustrated for several hours until I came across your help on Google search.